What happens when you bring one of the most highly regarded special effects makeup artists together with one of comics’ most terrifying super-villains? 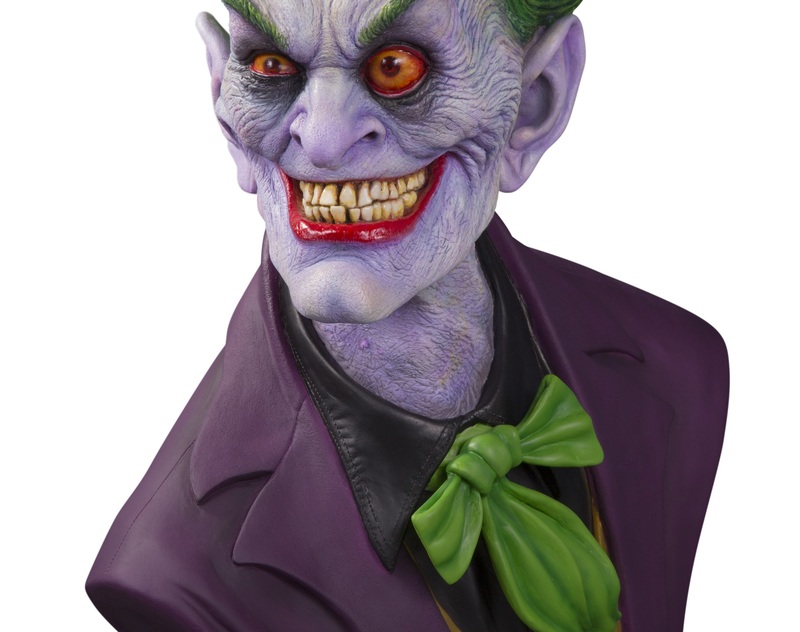 You get the frightening and absolutely spectacular DC Gallery Edition Joker Bust from the Academy Award-winning Rick Baker and DC Collectibles. Landing in stores next week, the high-end collectible is reproduced in 1:1 scale, allowing for an unprecedented amount of detail, intricacy and realism. It melds the vivid imagination of the makeup artist behind movies like Tim Burton’s Planet of the Apes, An American Werewolf in London, The Nutty Professor, Men in Black and TV’s Beauty and the Beast with the legacy of DC’s Batman universe resulting in a must-see piece for fans of the Dark Knight and Baker’s legendary work. We recently had the opportunity to chat with Baker about his work on the bust and what it takes to produce a collectible like this, along with his thoughts on the 1966 Batman TV series, which other famous Batman villain he’d love to tackle and how he once turned his entire family into a family of Jokers. Let’s start at the beginning. How did this project come about? It started when I visited my daughter Veronica, who works at DC. I went through the Collectibles department there and was impressed by everything, and one of the guys asked if I’d consider doing something for them. I gave him what can only be called a not-very-enthusiastic maybe. I’d just retired from the film industry, and one of the main reasons I retired is that I’d gotten fed up with too many different opinions, especially from people who didn’t know what they were talking about. I was looking forward to just doing my own thing and not having to deal with that. I assumed DC had very specific things they wanted and that I’d be very art directed, and that’s not what I wanted to do. Also, most of what I saw were on the small side and I don’t do little very well, so I figured it would never happen. Basically, everything I asked for, they said yes to, so I had to do it. You said that the Joker was the coolest. When did you become a fan? Was there any particular Joker on screen or on the page that did it for you? I like ones on the page better than on screen. You don’t have to deal with an actor. You can do what you want in 2D, and I think that’s always been a lot of the problems with the makeup versions—it’s on an actor and he has to be able to deliver dialog. There have been so many things I’ve done where I had a really cool design, but knew that the actor just wasn’t going to go for it. My favorite film version, though, is not actually the Joker. It’s The Man Who Laughs, which was Conrad Veidt and which inspired the Joker. That’s more what I would have done if I was going to do the Joker [in film]. Caeser Romero, no! [laughs] Seriously, you can’t shave your mustache? It’s not like it was a very big mustache. It would only take him a couple of weeks to grow it back. Now people love it because of that! I was so upset. It was such a tongue-in-cheek version that it really ticked me off. But now, the nostalgic part of it is fun. I’ll admit, I don’t know much about sculpting for statues, action figures and busts versus sculpting for makeup. Is there much difference in your approach and how you go about it? The sculpture part is basically the same. You’re pushing clay around until it looks like what you want it to look like. But the difference is that when you’re doing it as a makeup, you have to take into consideration the actor and that the actor’s face is basically the armature for your sculpture. So, if I want to carve into the cheek, but the actor’s face doesn’t allow for that, then I can’t do that. It’s an additive process. I can build cheekbones out to try to create the same effect, but then the piece gets big. So, there are a lot of limitations to doing it as a makeup, which you don’t have when you’re sculpting a bust like this. It’s a lot more freeing. That’s why I actually got more into animatronics and puppets in my film career because without an actor’s face in it, then design-wise I have a lot more freedom. I had a vague idea of what I wanted to do. I did a pencil sketch to start with and then a ZBrush model to kind of refine it and look at it. I knew the ZBrush wasn’t what the final thing was going to be, but it was close enough to be a starting place. So, I printed up a front-side view and a couple of other views of it. I knew that as I was pushing clay around, a lot of times it’s like the clay takes over. You’re doing this stuff, and all of a sudden, your hands are just moving and you’re not even sure what you’re doing, but it’s looking cool, so you just go with it. That’s kind of what was happening with this. I was in the zone and having fun, and it was going well. Every little line is basically a tool that I was carving in with. The textured part takes quite a while. Along with this bust, I know you also designed Joker makeup and costumes for your family for Halloween a few years ago. For that, you created versions of already existing Jokers, including some from the comics. Which was more fun or more creatively stimulating? Now that you’ve tackled the Joker, if you were to do another of these busts, which villain would you want to get your hands on? You know, I’d love to do another Joker, actually. After looking at this one, there are things I might do differently, and it gives me all this inspiration for a different version. But it would probably be Two-Face. I did the Tommy Lee Jones Two-Face makeup, which again had all of these limitations because of the actor. So, I’d be interested in doing a version where I didn’t have those limitations. DC GALLERY: THE JOKER 1:1 BUST BY RICK BAKER comes in two different limited editions, Standard and Ultimate, which is pulled straight from Baker’s original molds and featuring his original deco. Both editions are available through comic shops, specialty stores and online retailers on October 31.